preview form before submit is a common idea. idea of making such a plugin comes in my mind when i was working on a cake project and client ask me to do it.developer needs such a plugin most of the time and don’t like to write the same code in php js or jquery again and again. previewForm is a tool for displaying form content before it goes to the server for processing.This plugin provides users to confirm the data before they are going to sumit it. Preview the value of textbox. Preview the value of selectbox. Preview the value of radiobox and checkbox. Preview password field if option selected. Example 1 With password preview. Example 2 with password disable. 1. First, make sure you are using valid DOCTYPE and correct form structure. 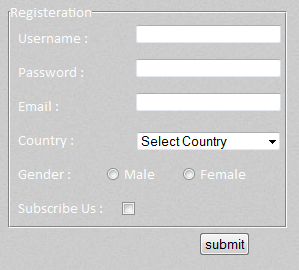 Your form must contain for tag of label with corresponding id of the field. 2. Include jQuery and previewForm JS files. forget wordpress admin password. no worry , there is a simple way how to reset wordpress admin password. cms don’t use plain text to store the password. WordPress stores its password using md5 encryption in mysql database. Here is some simple steps to reset wordpress admin password from phpmyadmin . One of my developer left the drupal project in middle, he didn’t told me the drupal admin password.After long search i get the code to reset drupal 7 admin password.This trick will works if you have access to ftp and database of your server. Create a reset.php with your text editor or developer ide.Place the content write below in it. Replace the “my_new_password” with the password you want to set. Upload this file in root of your drupal project. Access this file from browser.You will get the hash of your password. Open phpmyadmin. Goto your drupal database. and find database name in $databases variable. After that either execute the following query[sql]UPDATE users SET pass = md5(‘password hash’) WHERE uid = 1;[/sql]or proceed further. Click on the users table. Paste the password hash in pass field. let us resolve this issue and duscuss the ways to import large files in mysql with cpanel, wamp and lamp. 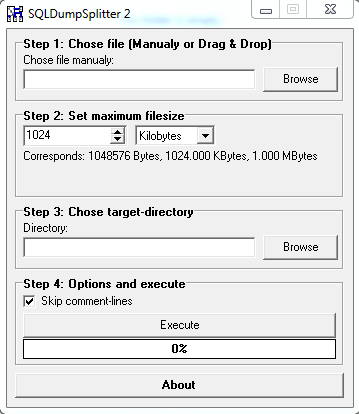 In this method you have to upload the dump sql file in server via ftp (like filezila). Wait for the script execution, do not close the browser . If Timeout errors occur, adjust the $linepersession setting in this file. If your max upload size is larger then your sql dump then how to Import large file in phpmyadmin ? But in this large file how can you split and from where to split. Well solution of problem is simple Dump Splitter , this tool that split your sql dump files into sub files. All you need to do is to import the file to this application, process it and then follow the instruction created by this application . This application divides your files into no. Of chunks you want. Also this application generate an instruction file that will tell you which file you need to import first. i.e. the file with table structure must be imported first. Suppose the size of your sql dump file is 80MB and your server allow you to upload only 20MB at a time then. Run sql dump splitter . Browse and select your file . Set the max upload size in this case select 19MB. Select your destination directory and execute. After that file generate the 6 files in your destination directory 5 with max upload size i.e. 19MB. Read me file tell you out of these 5 files which one must be uploaded first. So this is simple trick to Import large file in phpmyadmin if your max upload size less then file. 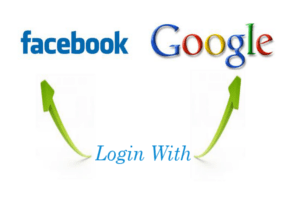 Login with Facebook and Google is not so much tricky .In this post we will discuss about facebook and google login in php with OAuth2 and at the end of the post you can download the utility( Login with Facebook and Google php script ). Page is not redirect properly during facebook login. well “Fatal error: Uncaught exception ‘Google_AuthException’” this error was nothing but confliction of google OAuth with facebook login To resolve this we use a two way switch method. when user login with facebook then we lock Google login and when user login with google then we lock Facebook login. Go To : Facebook Apps. Now create a new apps there, in section Website with Facebook login enter the url where you want the data of Facebook user. Now note api key and secret. Add and verify your domain.after verification your domain will be active. In API Access Menu Create a client id. Now check on web application , Enter your Doman and callback Uri where you want the data of google user. Paste your apps id and secret. 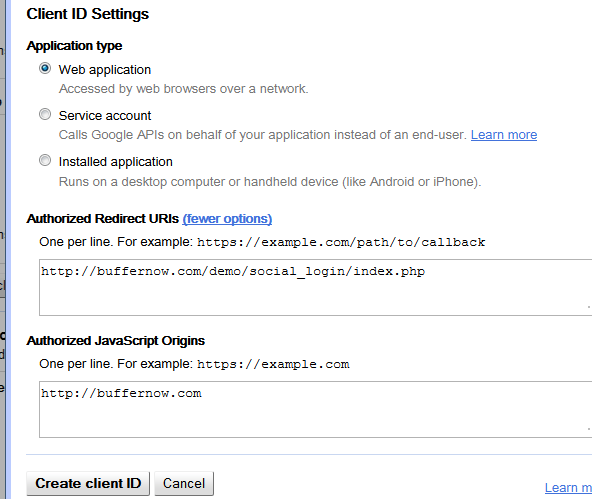 paste your site_name,oauth2_client_id,oauth2_client_secret and oauth2_redirect_uri. this Login with facebook and google php script is free and can be integrated with mvc system easily. Now download for free happy coding.